20 March - 24 October. 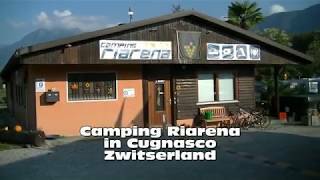 An agreeable site close to the route from Saint Gotthard to the south, Riarena may appeal both to those who are looking for a convenient night stop and to those seeking a holiday site, as it has a medium sized swimming pool and a children’s pool. Most of the site is covered by tall trees and is in a peaceful setting, although regular trains pass by. The 210 pitches (150 for touring units) are now all individually marked, with 10A electricity connections available. July is the busiest month – there is usually space at other times. There may be some aircraft noise from a small airfield nearby. A fully equipped, good quality sanitary block includes a few washbasins in private cabins. It is small for the size of the site, but showers have been increased and facilities for children and disabled visitors added. Washing machines and dryers. Shop. Restaurant. Takeaway. Swimming pools (15/5-17/10). Play area. Mountain bike hire. Free WiFi. From motorway exit Bellinzona south towards Locarno. After 10 km. at large roundabout turn to Gudo-Bellinzona for 2.5 km. and follow signs for Cugnasco from where site is well signed.